I had the great honor and privilege to travel with Bishop Paul Mususu and Pastor Lawrence Temfwe of Zambia for the last week. We began in DC, and soon made our way to New York City for UN meetings and civil society events. 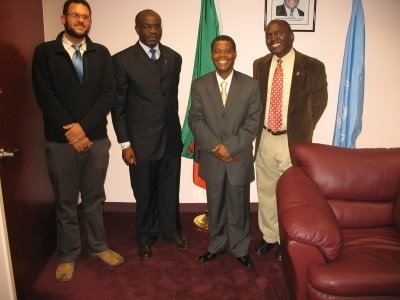 On Thursday night we were tired and a bit discouraged as some of our plans had not materialized the way we had intended, but that changed at about 7pm when we met with the Zambian Ambassador to the United Nations, Mr. Lazarus Kapambwe. As I travel the country engaging folks with Micah Challenge I always share with folks that the exciting thing about Micah Challenge is that our partners in the Global South are consistently and powerfully engaging their leaders on the MDGs, and are aggressively holding them accountable as well. This notion that we are working hand in hand with those in the Global South energizes the students and pastors that I meet with. I had the privilege of seeing this first hand on Thursday night. The Ambassador shared with us his views on the MDGs, and the challenges for Zambia to meet them. He highlighted fair trade as one of the most significant barriers to Zambia meeting the MDGs. It was amazing to see his commitment to the MDGs and to Zambia, and a blessing to know that there ARE leaders in the Global South who will stand up for the MDGs. It was likewise amazing to see how talented and insightful my colleagues Bishop Mususu and Pastor Temfwe were as they engaged with him on the MDGs. One thing that was very obvious was that these men were well known by the Zambian government because of their advocacy and development efforts back home, and that allowed them to get the meeting in NYC on such short notice. It was their testimony as church leaders who stand up for poverty that allowed them to even have such a meeting. I was definitely inspired, and as we continue to travel across the country meeting with church leaders and college campuses I look forward to what else I can learn from my Zambian Brothers. Will we follow their example and sensitize our political leaders so much to the MDGs that they become as articulate and passionate about them as Ambassador Kapambwe? Take the time to write a note to our presidential hopefuls asking them to commit to meeting the MDGs. A CHRISTIAN non-governmental organization has advised presidential candidates in the October 30 election to make a commitment towards the attainment of millennium development Goals (MDGs) by 2015. And National Royal Foundation of Zambia chairperson Chief Bright Nalubamba (right) has asked presidential aspirants to meet all traditional Leaders to explain their agenda for the rural poor before asking for their votes. In a statement, Micah Challenge Zambia national facilitator Pastor Lawrence also called on Christians in the country to vote for a person who would promote integrity, righteous and justice. “We call on all Zambians not to vote tribe, Chibuku, party or age, but character, vision and strategy on how we will attain the millennium Development Goals,” he said. And commenting on the heads of state meeting on the MDGs to take place in New York on September 25, pastor Temfwe called on leaders from the developing countries to urge G8 nations to fulfill the pledges they made to poor countries. Pastor Temfwe also expressed dissatisfaction with the US$60 billion pledged by the rich nations towards health. And chief Nalubamba said traditional leaders need to know what the presidential aspirants stood for so that people know who they were voting for. Chief Nalubamba said traditional leaders and the rural poor had the right to know what was there for them from the presidential candidates in the October 30 by-election. He advised the candidates to reserve some days of their campaign period for a meeting with traditional leaders to discuss issues that affected the rural communities. MICAH Challenge Zambia a Christian non-governmental organization (NGO) has urged presidential aspiring candidates to make commitments on how they intend to achieve the millennium development goals (MDGS) once elected into office. Micah Zambia national facilitator for the organization. Pastor Lawrence Temfwe said in a statement in Ndola yesterday that his organization was urging all candidates for the forth-coming elections to make commitments towards achieving the MDGs. Pastor Temfwe said it was important that the voters were availed by each candidate what they were promising to uplift the lives of Zambians. “We call on all Zambians not to vote on tribal lines. Or because of free Chibuku, or according to party lines or according to the age but vote according to the vision and strategy on how we will attain the MDGs.” He said. Pastor Temfwe called on Christians to vote for a person who would promote righteousness, integrity, hard work, compassion and justice. He said it was imperative that Christian voted properly because the majority of the voters in Zambia were Christians. Pastor Temfwe called on the meeting on September 25 that would gather in New York for the eighth year since the signing of the MDGs to work out modalities to achieve them. He especially called on the summit to effectively address the issue of children affected by HIV and called to intercede for the same meeting. We are cautiously encouraged by the progress being made in meeting the MDGs. We support the core principles of development policy that the government laid out in the Fifth National Development Plan, which is the vehicle Zambia is using to progress towards the MDGs. We are delighted to note that Zambia is showing strong commitment to promoting good governance that is allowing participatory approach for all key players and stakeholders based on transparency and rule of law, and broad based private sector-led growth. However, we are concerned that the free market we have embraced has largely created severely lopsided wealth in the hands of foreign minority. At this High-Level Meeting we call on the government to express its dissatisfaction at this imposed free market democracy that does not spread its benefits to the impoverished Zambian majority. We call on the government to confront the leaders from the developed nations that the political and economic models they are promoting don’t guarantee political stability or economic prosperity for Africans living in poverty. We appeal that the High-Level meeting effectively address the issue of children affected by HIV. There is need for meaningful financial commitment on maternal and child health, including the prevention of mother-to-child transmission. We are concerned that the current projected $60 billion funding by the G8 for health over the next 5 years falls short of what is required to achieve the health related MDGs and Universal Access by 2010. Based on the current UNAIDS’ resources estimated, the G8 share of resources for HIV alone is $65 billion for the next three years. The High-Level meeting must ensure that the food crises doesn’t slip off the political agenda especially considering that 850m people in the world were chronically food insecure before the food prices rose globally. It is also vital that the High-Level meeting address the root causes of the food crisis, and make it a priority to invest more mitigation, preparedness and adaptation so that poor communities are more resilient and they are not pushed over the edge when prices rise. We urge all presidential candidates to make a commitment to achieving the MDGs. There is need for Zambian voters to listen carefully to what each candidate is promising to do in uplifting the lives of Zambians out of extreme poverty. We call on all Zambians not to vote tribe, chibuku, party or age but character, vision and strategy on how we will attain the achievement of the Millennium Development Goals. We call on Christians to vote Bible. Christians can form the largest voting block in this nation. We call on Christians to vote for a person who will promote righteousness, integrity, hard-work, compassion and justice.